Panama leader General Manuel Antonio Noriega was indicted by a U.S. grand jury along with 16 of his associates on charges of drug smuggling and money laundering. General Noriega was also charged with smuggling marijuana into the U.S. and assisting a cocaine drug cartel. 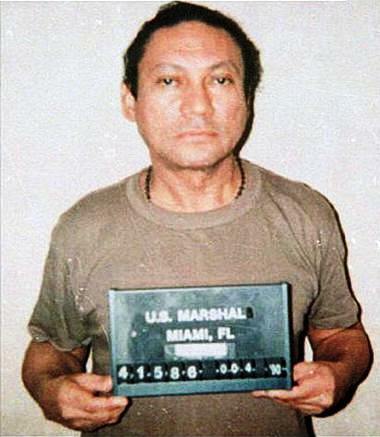 Manuel Antonio Noriega was born on February 11, 1934 in Panama. Although he was never officially president of Panama, he held the position of “chief executive officer” for a brief period of time. The 1989 U.S. invasion removed Noriega from power; he was captured, then detained as a prisoner of war and flown to the United States. In April 1992, Manuel Noriega was (finally) tried on eight counts of racketeering, money laundering, and drug trafficking. Manuel Antonio Noriega’s inmate identification number is 38699-079. In December 2004, he was briefly hospitalized after suffering a minor stroke. The Federal Bureau of Prisons website as of February 2008, does not give a projected release date for inmate Noriega. However, he may be handed over to another country for trial or imprisonment instead of being released into the public realm. Noriega’s prison sentence was reduced from 30 years to 17 years for good behaviour. After serving 17 years in detention and imprisonment, his prison sentence ended Sunday September 9, 2007.
previous post: Jasmine Pilchard-Gosnell Engaged To Paul Walker. Maybe. 50 queries in 2.606 seconds.